We are big fans of Bonefish Grill’s Bang Bang Shrimp, but with two small kids in our house, going out for a nice dinner is considered a luxury. Awhile back, my husband decided to try and create a Bang Bang shrimp copycat recipe and as luck would have it – this recipe is pretty close to perfect! We’ve served this dish many times for our “at-home date night” and for guests and it never disappoints! Mix ingredients for sauce and sit aside. Mix egg and buttermilk and let shrimp soak in the egg/milk mixture for 15-20minutes. Place a few spoonfuls of sauce in large bowl and toss with shrimp until coated. Serve over a spring mix salad or baby spinach. I kid you NOT, I was just telling my husband this past weekend that we need to go to Bonefish and order these shrimp! Absolutely DELICIOUS! Please tell your husband thank you for the recipe!!! That is awesome, Jessica! Great minds think alike! 🙂 I can’t wait to hear what you and your husband think about this recipe! Enjoy it! Is it 1/4 cup of the chili sauce???? Hi Karen – I’d suggest starting with 1/4 cup and then adding to a taste to your liking. If you like spicy, may want to add more! Hope you enjoy! Thank You. It only said 1/4 and I thought it was a cup but could have been a tsp… Thanks again. Can’t wait to try it. Oh, my gosh, this looks sooo good. My hubs is not a big fan of shrimp, but I think he’d enjoy it like this. I’m pinning and stumbling! 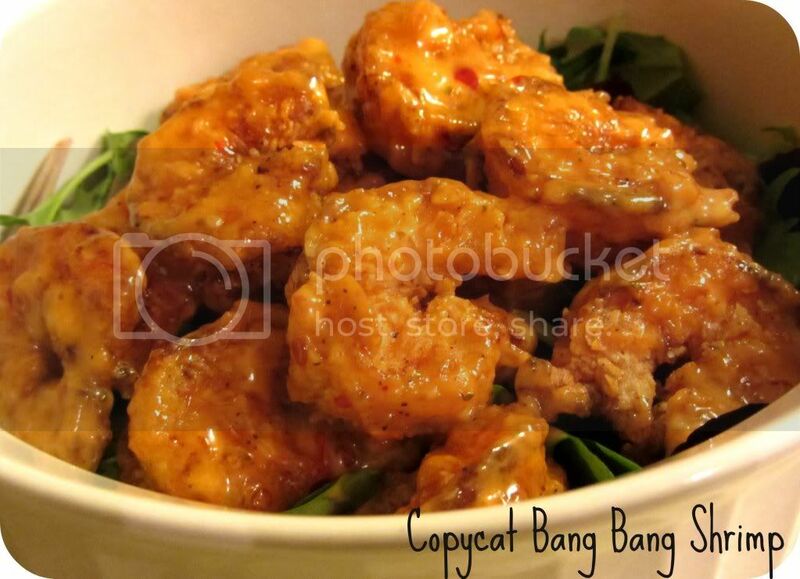 My daughter LOVES Bang Bang Shrimp, so I am definitely going to try this! Oh Naomi, she is going to love these! They are so tasty! Just pinned this! Looks delicious! Thanks Trish! Hope you enjoy it! Thanks Claire! I just went over and added this post to the hop! Thanks for letting me know! Oh Samantha – these are so good! Definitely give it a try! I appreciate you stopping by today! Oh YUM!! Just pinned this, it looks awesome! Thank you so much, Jen! Enjoy! Delicious 🙂 I am going to have to make this soon! Natalie – You won’t be disappointed! They are delish! 🙂 Thanks for stopping by today! Love this! I’m bookmarking maybe to try for my hubby’s birthday! Awesome, Kristy! I hope he enjoys it! Keep me posted! Hi Megan – I’m so glad you found me today! Love that you have a daughter with T21 too! This looks amazing! I have never tried Bonefish, but I’ll have to make this at home for ME since Heath is allergic! Poor Heath! I can’t imagine being allergic to shrimp – they are one of my favorites! YUMMY!!!! This is a definite must make! Awesome! Keep me posted on what you think of them! That looks absolutely mouthwatering…..love the thick sauce layer on the shrimp. That’s the great thing about this dish! You can add as little (or as much) sauce as you want! We like to load ours up with sauce! WHOA>>>> That looks absolutely delicious. Wow! This looks so yummy! I cannot wait to try making it!! Thanks Shelby! I hope you enjoy them – they are so delicious! Delicious! I love trying new and exciting recipes! Seems easy too! These are super easy to make and have tons of flavor! Enjoy! What is the unit of measurement for the Thai sweet chili sauce? 1/4 Cup? Thanks for clarifying. Hi Megan – Thanks for reading! I would suggest starting out with a 1/2cup and then taste it to adjust the spice level. We like ours spicy, so we always add extra, but it really depends on how much spice you like in your food! Hope that’s helpful for you! Made this tonight..was sooooo good!! Was very easy & tasted amazing! In the process of putting this together for dinner tonight…I LOVE this recipe….can’t imagine it won’t be amazing!! Thank you!! I hope you had a fantastic dinner, Diane! Thanks for trying it out! This is my favorite Bonefish dish Have been craving it. Cannot wait to make this! Thank you for the recipe. Hope you enjoyed it, Kelly! These are my favorite! Oh my goodness, these ARE amazing! They really do taste like Bonefish, I fried mine in Coconut Oil to make it healthier and also served it over spinach leaves. Yum, thanks for the recipe!!! Made this for my family last night. It’s a no fail recipe. The shrimp was moist, tender and crispy on the outside. We used the sauce as a dip. It’s was really good. Everyone loved it. Hi Nicole – I’m so glad to hear this recipe was a big hit with your family! Thanks for letting me know! This shrimp is amazing!!! Only pan fry small amounts at one time so it is time consuming but it is delicious! I fixed it for my husband and some friends and everyone kept saying how good it was. I used 3 Tbsp of honey and a little more of the chili sauce than mentioned. Maybe less honey next time so it is a little more spicy. I’m so glad to hear you all enjoyed it! It’s definitely a favorite around our house too. I’ve had 35 systems since October 2014, I sent all the necessary screenshots, and was given the Super Signals system, which didn’t work attributable to bugs.